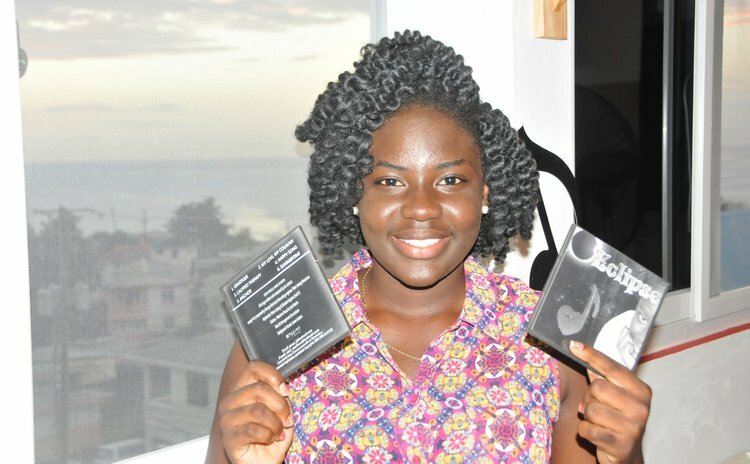 Young budding artiste, Janae Jackson, has released her first album that she has named "Eclipse", an apt description of the album cover and apparently her stage of development as an artiste. A real-looking full eclipse of the moon is in the top right corner of the cover of the album and there's a half- smiling, half-face photo, one eye and a half-a-nose, with half-a-hand under half of her chin, all pasted in black and white on the right edge of the all-black cover. Imagine if this was a real eclipse. On the cover Janae would be slowly coming into full focus, exploding into full exposure towards the centre; in song and dance as the eclipse continues Janae, the artiste, will slowly show her full potential, ripening from the inside out, like a Julie mango. "Eclipse" is an impressive start. The album was released on at the Joval's Terrace located upstairs Bull's Eye Pharmacy on Federation Drive, Goodwill on February 3, 2016. It contains six songs; two were her repertoire at the 2016 Calypso Finals on February 8th at the Pottersville Savanah. Janae sang "Gratitude" in round one and "My Love, MY Country" in round two. Ian Jackson, Janae's father, wrote five of the six songs on the album. "I know Janae is formally trained in musical theory and that's very important for musicians in Dominica to excel," said Acting Assistant Chief Cultural Officer, Gregory Rabess at the launch of Eclipse. He encouraged artistes to study the craft and technic and to also listen to a wide variety of music in order to appreciate the diversity of music not only in the Caribbean but in the wider world. "When we release an album we are not just releasing it for Dominica, it's a global marketplace so we are releasing it to the world," said Rabess. Therefore, he said, artistes should recognize the value that goes into the production of an album and a particular song. President of the Dominica Calypso Association Derrick "Hunter" St Rose said he was proud of Janae for releasing her first album. St Rose advised Janae that it is important to learn the business side of producing music. "Because too often we have calypsonians that just come for the season and after the season they gone to sleep," he said. St Rose stated that it is important to have music that can people not only to Dominicans. "That's why it is important to have songs with international appeal so when our people do not want to hear your songs; elsewhere people will pay to see," he said. Hunter said he admired the level of discipline that Janae shows and that she should not allow success to go to her head. "You may win a hundred crowns, you could mash up Dominica how you want and your attitude is bad, you're not going to go too far; people will hire you, they see your attitude, they will drop you and never call you again," he said.